Chhattisgarh Vyapam conducts examination for various courses and recruitment in the state of Chhattisgarh. We on this site is bringing for you all the details required regarding CG Vyapam Recruitment. Various posts are there to be filled by CG Vyapam Recruitment all across Chhattisgarh. Candidates who are searching for Government jobs in Chhattisgarh State can apply for this CG Vyapam Recruitment 2019 through Online mode. Also, here we provide all the details regarding dates, vacancies of CG Vyapam Recruitment. 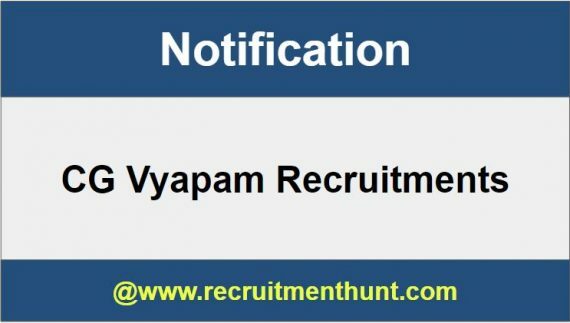 The Complete vacancy list for CG Vyapam Recruitment 2019 has mentioned in the above table. So, here we advise candidates to start preparation for CG Vyapam Exam as early as possible. Candidates should also visit the official website of CG Vyapam for more details regarding CG Vyapam Exams. Candidates can also download CG Vyapam Previous Papers for all the Exams. In the above table, all the details regarding CG Vyapam Exam are stated as the requirements. Candidates must apply for the CG Vyapam Recruitment only through the online mode by following the links provided below. Also, Aspirants can check the previous papers and syllabus for CG Vyapam 2019. Likewise, all the other details you will get as you go through the page and have a look. There are the various age limits for all the other courses which you are opting for. Therefore different courses age limit is given below. For Revenue Inspector Posts: Any Degree or Post Graduate Degree or from any recognized University or Institution. For Board Coordinator Posts: Any Degree or Post Graduate Degree or from any recognized University or Institution. For Accountant Posts: Post Graduate Degree (Commerce) and Degree/ Diploma (PGDCA) in Computer Application from any recognized University or Institution. For Sanitary Inspector Posts: Post Graduate Degree (Commerce) and Degree/ Diploma (PGDCA) in Computer Application from any recognized University or Institution. Inspector, Assistant Inspector, Field Officer & other Graduation from any recognized University or Institution. Staff Nurse Graduation in Nursing from recognized University or Institution. The selection process for CG Vyapam Vacancy 2019 is based on the basis of the following. Download CG Vyapam Notification and read its instructions carefully. Now, click on the Apply Online link appearing on the screen. Fill all the details in the CG Vyapam Recruitment Application Form and upload any documents if necessary. Pay the application fee if applicable using any online payment options. Recheck the application and click on the submit button. Finally, take a copy of the filled application form for future use. Finally, Book Mark our website Recruitment Hunt regularly for more latest updates regarding all other Government Jobs.